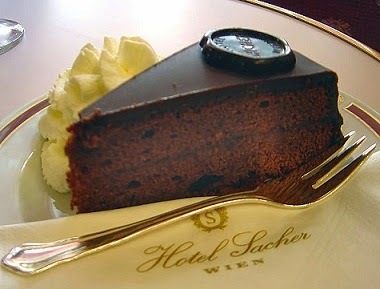 This is the ORIGINAL Sacher torte as sold at Hotel Sacher. The cake is pretty dense and dry, it's layered and the cover is hard: it's not ganache. It's actually made by making simple sugar syrup and melting the chocolate in the syrup. The cake is made without any rising agents, except the egg whites. This Mary Berry gets right. The apricot preserve is to be warmed, sieved and have a little dark rum added. It works to preserve the cake. A Sacher can be preserved for two weeks after finishing, because of the apricots and chocolate cover. The Demel Sacher is baked according to the recipe of the original creator, and it isn't layered. Mary Berry's Sacher is not a Sacher. Delia Smith's Sacher is absolutely not a Sacher! This is the original recipe, obtained through the courtesy of Mrs. Anna Sacher. Beat butter until creamy. Melt chocolate. Add sugar and chocolate to butter; stir. Add egg yolks one at a time. Add flour. Fold in egg whites. Grease and butter 8-9" cake tin. Pour mixture in. Bake in 275 degree F. oven about 1 hour. Test with toothpick or straw. Cut top off and turn bottom up. Heat apricot jam slightly and spread over top. Cook sugar and water to thin thread. Melt chocolate in top of double boiler. Add sugar gradually to chocolate. Stir constantly until icing coats the spoon. Note: If desired, split cake into 2 or 3 layers. Fill with apricot jam or whipped cream.